A sunbed provides artificial sunlight usually for the purpose of getting a cosmetic tan. Sunbeds emit mostly UVA rays, with a small percentage of UVB rays, and were discovered by accident in Germany in 1903 at a company that was working on lighting systems for homes and industry. They were first marketed in the 1930s as wellness and tanning devices. There are various health risks associated with sunbeds, but there are also many benefits and careful responsible use can do more good than harm in most cases. The health concerns surrounding sunbeds are generally due to the UV light that they emit. This light comes in three different wavelengths which are each associated with different effects. UVA rays make up the majority of rays from a sunbed; they do not burn the skin but they do penetrate more deeply than other UV rays and although they do not have a direct effect on DNA they can create chemical reactions that may in turn damage DNA. UVB rays make up a tiny amount of sunbed rays; they are the damaging rays that can cause burns, ageing and skin cancers due to the damage they can do to DNA. UVC rays are not found in sunbeds. Sunbeds have the same levels of UVA light as natural sunlight, but the reduced levels of UVB light means that the warning signs such as skin reddening and burning are removed from a sunbed. Use of sunbeds should be limited to a few minutes depending on your skin tone, and eye protection should always be worn. There are many health benefits associated with sunbeds, especially for those in countries with little natural daylight during the long winter months, as vitamin D production can be increased with sunbed use. 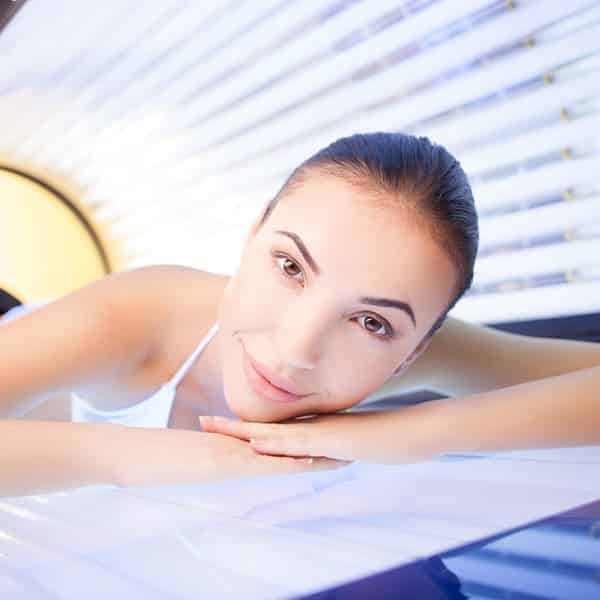 Many people who enjoy sunbed sessions report a feeling of general wellbeing and a much better mood after a few minutes under the glowing tubes, and the replication of natural light can help sufferers of seasonal depressions or low moods. Sunbeds can be used in the treatment of skin conditions such as psoriasis and dermatitis, but this should only be done under medical supervision. Many people believe that a sunbed can provide a base tan and therefore some protection against the sun on a beach or other warmer climate holiday; this may be true but it is vital that sunscreen is also always used to protect the skin against the sun’s rays however much of a tan you already have. Sunbed use in moderation and with well-maintained and monitored beds such as those at the Belmore Centre in Aylesbury does not appear to do any more damage than day- to-day exposure to daylight. Those people wanting the warm glow should use a sunscreen to protect themselves, and sessions should be limited in both frequency and duration. A good fake tan is another option for those wanting a sun-kissed look. Some skin is simple not designed to tan at all, and people with this kind of skin tone should take great care when using sunbeds as the usual warning signs are masked. Overall, moderation is the key and the safe use of a sunbed can promote wellbeing, relaxation and an enhanced mood.